The 2013 RAM 1500 is more fuel-efficient thanks to a new V-6 engine, 8-speed automatic transmission, available automatic stop/start technology, and electric steering. Styling changes improve aerodynamics and contribute to the truck’s maximum 25-mpg highway mileage rating. The RAM 1500 also has a re-engineered frame, a new front suspension, an optional air suspension, and an optional remote-locking Ram Box. New Uconnect Access technology turns the RAM 1500 into a mobile Wi-Fi hotspot. The 2013 RAM 1500 is sold in regular cab, extended cab, and crew cab styles with a choice between a short or long cargo box and 2-wheel or 4-wheel drive. The extended cab model is called the Quad Cab, and is equipped with 4 forward-hinged conventional doors. Trim levels include, in ascending order of price, the Tradesman, Express, HFE (High Fuel Economy), SLT, Lonestar, Bighorn, Outdoorsman, Sport, Laramie, and Laramie Longhorn. RAM 1500 buyers can choose between three engines. The standard engine for 2013 is a 4.7-liter V-8 producing 310 horsepower at 5,650 rpm and 330 lb.-ft. of torque at 3,950 rpm. A 6-speed automatic transmission is standard, and this engine can tow 7,700 pounds when properly equipped. A new 3.6-liter V-6 engine is optional, and is paired with a new 8-speed automatic transmission. The V-6 generates 305 horsepower at 6,400 rpm and 269 lb.-ft. of torque at 4,175 rpm. Its maximum tow rating is 6,500 lbs., depending on model and equipment. For maximum towing and payload capability, the optional 5.7-liter V-8 engine is recommended. This engine, which makes 395 horsepower at 5,600 rpm and 407 lb.-ft. of torque at 3,950 rpm, is rated to tow up to 10,450 lbs. The V-8 is equipped with a Multi-Displacement System designed to shut half the cylinders off under low-load conditions to help conserve fuel. The EPA says the 2013 RAM 1500 returns fuel economy ranging from a low of 13 mpg in the city for the 5.7-liter V-8 engine paired with a 6-speed automatic and 4WD, to a high of 25 mpg on the highway for the HFE model with the V-6 engine, 8-speed automatic, and 2WD. In combined driving, the ratings span from 15 mpg to 21 mpg for these same models. 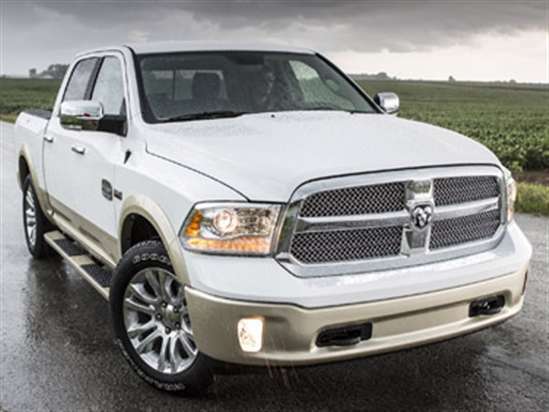 In NHTSA crash tests, the 2013 RAM 1500 models receive a 4-star overall rating. Trucks with 2WD have a 4-star rollover resistance rating, while trucks with 4WD rate 3 stars. In Insurance Institute for Highway Safety (IIHS) tests, the RAM 1500 is rated “Good” in the moderate overlap frontal-impact test, “Good” for rear-impact injury prevention, and “Marginal” for roof crush strength. The IIHS has not tested the 2013 RAM 1500’s side-impact protection. For 2013, the RAM 1500 can be turned into a rolling Wi-Fi hotspot thanks to its new Uconnect Access option, which includes 9-1-1 emergency services. Additional updates include active grille shutters for select models, a new air suspension, rain-sensing wipers, and SmartBeam headlights.